The Constitutional Court will address the flaws of the country’s language legislation, says human rights defender Aliaksei Valabuyeu, citing a reply to his petition. 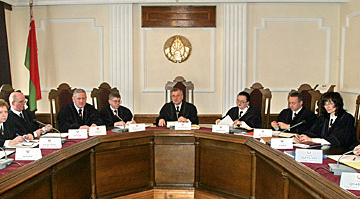 “Head of the Secretariat of the Constitutional Court, Mr. Karavai, said that the questions about the elimination of gaps in the linguistic normative legal acts and the exclusion of conflicts and legal uncertainties set by me and others Salihorsk residents was already being studied in the Constitutional Court. They promised to report later on the results of the study,” says Aliaksei Valabuyeu. The human rights activist stresses that citizens were previously unable to appeal to the Constitutional Court directly. Recent changes in legislation provided this opportunity in certain matters. The first issue was the protection of the Belarusian language against discrimination initiated by a known human rights activist, legal expert of the Belarusian Helsinki Committee Hary Pahaniayla.